The 2015 World Champs had highs and lows. The mournful absence of Natalia Molchanova /the resurgence of her son Alexey, who claimed two golds. The alarming oversights for Néry’s world record attempt in the pre-comp/the attention to detail in providing for athletes aboard the competition platform. It would be unfair to only fault the competition, but it would be unwise not to use the shortcomings as opportunities for growth and improvement. So I think we should celebrate the hard work and successes of this year’s World Champs, but not equivocate on the serious issues that were brought to light. I was amongst the vanguard of athletes to arrive several weeks ahead of the World Champs. The organisers were ready for us, with a dedicated RIB dive boat and safety team to look after us in our training, and they went out of their way to help athletes get settled in Cyprus, with transfers, accommodation, and local SIM cards. This kind of treatment creates a great positive energy before the comp begins, and the appreciation from athletes was evident at the closing ceremony, where the head organisers received a rousing and prolonged ovation. The safety team were very supportive as well, and all were experienced and competent divers. Will ascending to an FIM Gold. A certain amount of bad luck came into the competition, with changeable weather and sea currents, a freakish sandstorm, and errant line markings. However we often have more control over our luck than we think. Competition or training was canceled or suspended on at least three occasions due to sea currents and swell. Could it have been known from a location audit that this dive site was susceptible to current/weather in mid-September? One strip of electric tape at the 140m mark was lost from the rope, causing a seriously life-threatening incident. That’s bad luck, but it was very bad oversight that there weren’t protocols in place to spot the marking error, and that it was the only verification method used for line depth. This was also the first AIDA Depth WC in which no world records were announced, and all gold medal performances were lower than the previous world champs. Could this have been due in part to the very early start times for top athletes, who found out the evening before the event and had no time to adjust? The requirement for standards and protocols for running a high-level AIDA comp or WC. The principal objective of the AIDA WC (after safety). 1. The requirement for standards and guidelines for running a high-level AIDA comp or WC. The last four AIDA depth WCs (07, 09, 11, 13) were staged by organisers who had previously run one or more high-profile AIDA events. They’d had opportunities to iron out problems and errors prior to taking on the WC, and knew what athletes would expect of them. When AIDA awarded the 2015 Depth WC to Cyprus nobody noticed or appreciated this difference, and it seems there was a natural assumption that the new organiser would know how things had been done in the past and follow suit. That assumption shows a gap in the process, where there should be a requirement from AIDA for a more detailed logistical plan from the organiser or an on-location audit by an AIDA staff member 1-2 months ahead of the event, or both. Essentially, after being informed that they had won the bid to host the WC, it appears Cyprus was largely left on its own until the judges arrived a few days ahead of the event. This lead to easily avoidable errors such as a counter-ballast line too close to the competition line, uncalibrated sonar, and a lack of certain items of medical equipment. Merely blaming organisers or judges in these cases is not accurate: it is really a symptom of inadequate regulations and guidelines for the World Championships. What can be done? Earlier this year, I started writing an ‘Organiser’s bible’ for running Vertical Blue, so that I wouldn’t have to explain everything to team members each year. When completed, it will have full job descriptions of each role, as well as all the safety protocols, equipment lists, operating guides, excel templates and more. 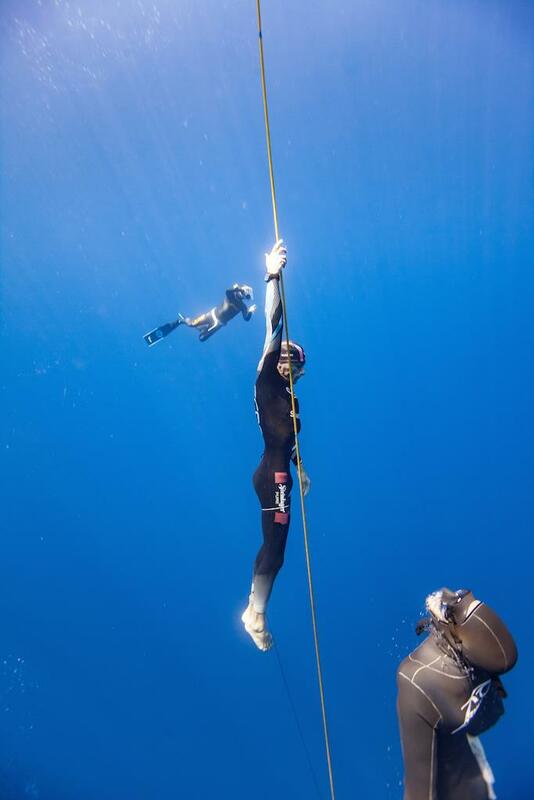 It will be fairly easy to adapt and elaborate on this work to make it applicable to any major freediving depth competition. This was also discussed at the AIDA assembly meeting during the WC, and AIDA Sport Officer Ute Gessman announced she would form a workgroup to create guidelines for major competitions. AIDA’s greatest strength is its members and its wealth of information and experience. Centralising and recording this info and experience for education has been performed very efficiently, but the same process has been overlooked for freediving competitions. As the sport becomes more professional and widespread, in order for AIDA to maintain its position as the global standard in competition and records this work to develop competition standards will be important and ongoing. 2. The principal objective of the AIDA WC (after safety). 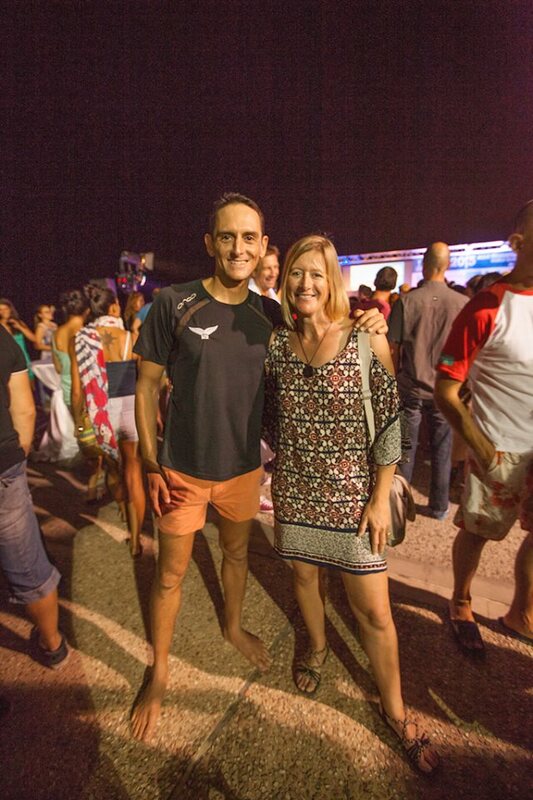 Every two years there are 100 or more freediving competitions around the world in which athletes can attempt personal bests and national records/rankings. In the same period there is one, and only one, competition in which athletes may compete to become world champion. Therefore in this competition priority should be given to athletes who are contending the championship over those who are attending for the other reasons. In this case, a higher attendance at the World Championships is not a positive result IF it entails a reduction in the standard of competition for those athletes who are contending the championship titles. For example if, in order to fit in all the athletes, the deepest dives are scheduled at 0800, or at a time when conditions aren’t preferable, or with insufficient time between OTs, then the event is failing in its primary objective. In general, this singular event should be designed in such a way as to support the process of deciding the world champions. Perhaps that means holding a qualification round, as is done in the pool WC? After all, there are very few sports where a champion is decided by a single jump/throw/lift/dive, especially one that is announced the evening before. Qualifying depths could count towards the finals as well, and this would add suspense as well as consistency in results. The oft-quoted obstacle to these objectives is budget limitations, but I believe that only once the format of the World Championships is centred upon the contesting of the World Champion title will the media become more interested in the sport. And with media attendance comes increased sponsorship, and thus a greater budget. Coming from myself, these concerns may seen self-interested, but I still believe it to be objectively true that any sport that decides its world champions in the first dives of the first day of the event will both frustrate its top-performing competitors and limit attention from media. The deepest ten athletes must dive in order from shallowest to deepest: this means that shallower divers don’t sometimes gain a tactical advantage, and it also lends more suspense to the competition. The time interval between OTs should be a function of announced Dive Time (DT), e.g. DT+7 minutes. This system has been used in Vertical Blue for years, and recently in other competitions also, and is both more fair and more practical than a constant OT interval. If an athlete follows a diver who has an announced dive time of 4:30 then it is common sense that there should be a longer interval than if the announced dive time were 1:30. DT+7 ensures that all athletes enjoy a more or less equal amount of time on the competition line prior to their OT. Tags are the physical testimony that an athlete has achieved a certain depth. They should be made carefully, in a way that isn’t reproducible (e.g. embroidered with the AIDA or sponsor logo), and should be retrieved from the athlete immediately after their dive. They should be attached with cotton thread or velcro, or another method that doesn’t involve pollution of the sea. Announcements should be posted into a locked box made out of wood, metal or similar. Medals should be awarded in the same way as they are for the Olympics and all other sports (i.e. if there are 2 silver medals then no bronze is given). Though we are free to choose our methods, and might award 2 golds, 2 silvers and 2 bronzes, or 4th, 5th, and 6th place medals, these measures only serve to dilute the prestige of finishing in the top three athletes, as well as demonstrate an amateur status in our sport. Of course there are obstacles to these guidelines (shallow-to-deep order makes line-setting more difficult, irregular OT intervals create difficulties in managing two adjacent dive lines etc, etc), but there are solutions to these obstacles, and if the above guidelines become stipulations then organisers will easily have the time and means to find these solutions. I believe that a World Championship event that is supplied with a comprehensive set of guidelines, and that has a primary goal (after safety) of providing the optimum format for contesting the championship titles, will raise the level of professionalism, safety, athlete satisfaction and exposure of this, AIDA’s flagship event. As we lower the bottom plate to the first announced depth, together let’s raise the bar on our standard of competition at AIDA International.